Reading the Fantastic Four comics from the start. Now that all the Dr. Doom/X-Men/Mephisto stuff is over, we get back to the main plot in issue #306, in which Reed and Sue are out the door, and Ben is leading a whole new FF team. The current lineup is Ben, Johnny, and Crystal. Who will be the fourth? 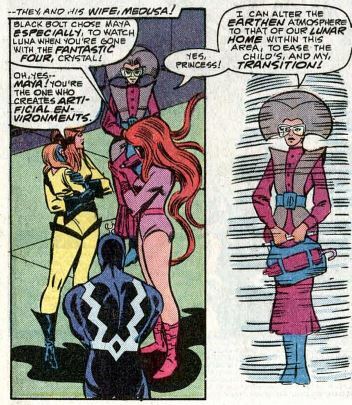 The Inhumans show up at Four Freedoms Plaza so Crystal is reunited with her infant daughter, Luna. We’re told that an Inhuman nanny, Maya, is taking care of the kid while Crystal is off doing the superhero thing. Medusa, who is now queen of the Inhumans, says she and Black Bolt approve of Crystal joining the FF, adding it’s just what she needs right now. Out in the streets of New York, Captain America shows up with Ms. Marvel. That is, the second Ms. Marvel. A lot of you are probably saying “Who?” right now. For most, Ms. Marvel is either the original, Carol Danvers, who went on to become Captain Marvel, or Kamala Khan, the new teen Ms. Marvel. This one, though, is neither. 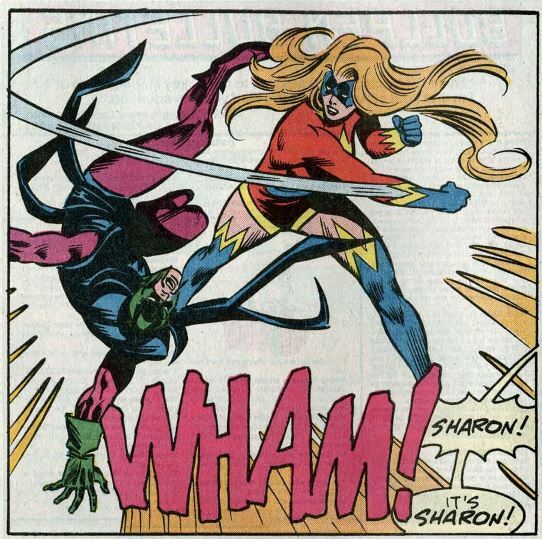 Meet Sharon Ventura, who was Ms. Marvel during the Thing solo series. We’ll get to her background in a bit. Captain America is just giving her a ride. He reaches out to touch her cheek in a friendly gesture (okay…) and she shies away from him, not wanting to be touched. Cap drives off, leaving her standing there rather bewildered-looking on the streets of Manhattan. Inside HQ, there’s a bit of action as the Inhumans release Quicksilver from his cell where he’s spent the last few issues. There’s a quick fight before Lockjaw, the Inhumans’ giant dog, subdues Quicksilver. The Inhumans take Quicksilver back to the moon, saying he’s their problem now. Ben then sees Sharon outside and runs out to greet her, only to find she’s run off. Wandering New York, Sharon flashes back to her origin. She was a pro wrestler who became enamored with Ben while he was with the goofy Unlimited Class Wrestling Federation. She went to a mad scientist called the Power Broker and got superhuman strength and agility thanks to his evil super-steroids. The steroids made her addicted. She went to another mad scientist, Dr. Malus, who promised her a cure, but instead he abducted her and had all his henchmen, uh, have their way with her. (Gross!!!) With Captain America’s help, she escaped and now wants to reunite with Ben. Everybody fights! 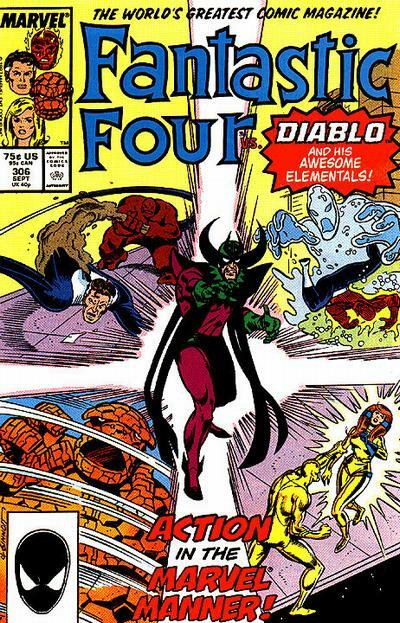 Diablo has used his powers of alchemy to create a bunch of monsters to counter the FF’s powers. A “trans-mutant” turns Crystal into gold. Ben finds himself swarmed by a hurricane-like air creature that he’s not able to punch. Reed, Sue, and Johnny join the fight. A mud-like creature buries Reed so he can’t breathe, a water monster snuffs out Johnny’s flame, and a fire creature traps Sue inside one of her own force fields. 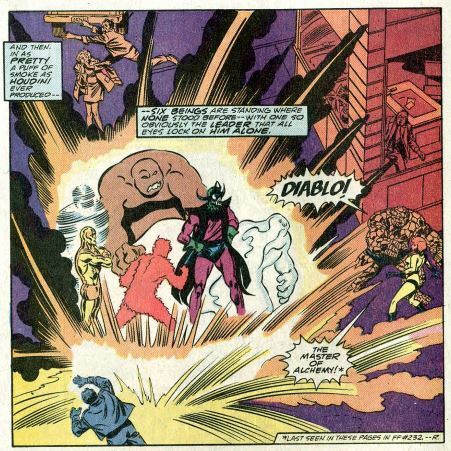 Just when all seems hopeless, our hero Sharon Ventura sneaks up behind Diablo and punches him real good. Knocking out Diablo also conveniently destroys his monsters. Sharon wants to beat up Diablo some more, but Ben stops her. She admits to Ben that, because of what happened to her, she hates all men except for him. (She didn’t seem to hate Captain America earlier, so maybe she’s exaggerating a little.) She asks Ben what she should do, and he invites her to become the new fourth member of the Fantastic Four. Unstable molecule: Medusa states that the medicine Reed made for Crystal will now allow the Inhumans to visit Earth whenever they want without fear of pollution harming them. Fade out: Seeing Crystal with Luna reaffirms for Sue the importance of leaving (or at least taking a break from) the Fantastic Four, to spend more time with her son. Clobberin’ time: Ben appears to have turned a corner as to his heartbreak over Alicia and Johnny being married. We’ll see how long this lasts. Flame on: Johnny manages to turn all of Diablo’s water into steam, only for Diablo to instantly re-form it back into water, trapping Johnny in an endless cycle of water-steam-water. Fantastic fifth wheel: Everyone say hello to Sharon Ventura. Get used to her, because she’s going to be around for a long time. The concept here is that she’s a superhero with PTSD. For some, that’s empowering. Others, however, feel the PTSD was poorly handled. In issues to come, the “T” in PTSD is going to get a lot, lot worse. So settle in for a lot of tears and dramatic hand-wringing wherever Sharon goes. Crystal and Diablo both remember how he enslaved her way back in issue #118. That’s why he brought the trans-mutant along with him — specifically to deal just with her. Four and a half: Franklin is referred to as “Frank” throughout this issue, perhaps to make him appear older in comparison to baby Luna. 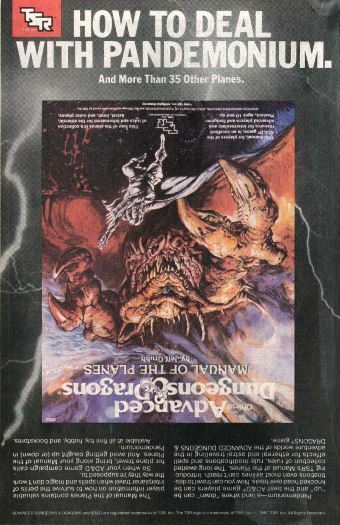 Commercial break: Look at TSR trying to be all wacky by publishing an upside-down ad. But, really, did anyone ever manage to level up their characters to the point where they could do far-out stuff like visit other planes? 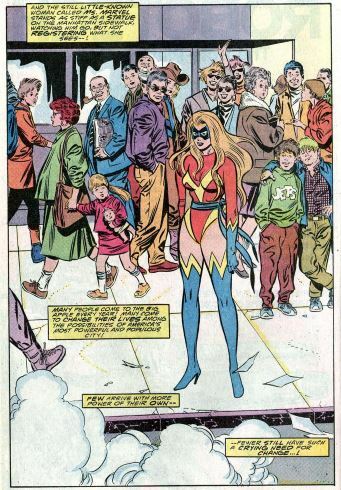 Trivia time: In addition to Carol, Sharon, and Kamala, there was another Ms. Marvel — Carla Sofen, a.k.a. Songbird, who was an evil Ms. Marvel during the Dark Reign crossover. Look closely at the billboards in the background of this issue. “Balent’s Photos” is a shout-out to comic artist Jim Balent. Also Walter Hill’s 1979 film The Warriors is still playing at a movie theater. Fantastic or frightful? Other than introducing readers to the then-new Ms. Marvel, there’s not much that happens in this one. Diablo especially suffers from generic villain syndrome. There’s one more issue to go before we settle into this new team, then we’ll see what’s really in store for our heroes. Next week: Have fun storming the castle.